This is, needless to say, an exorbitant risk for any author to take, even one as popular and critically acclaimed as National Book Award-winning Powers. If you write a long book in which trees talk, you run the risk looking silly, which is the green kryptonite of serious fiction. Likewise if you preach, you run the risk that your preaching will outstrip your storytelling – if it doesn't, you have a work of mind-changing art like Uncle Tom's Cabin, but if it does, you're stuck with a leaden piece of polemic like The Jungle. 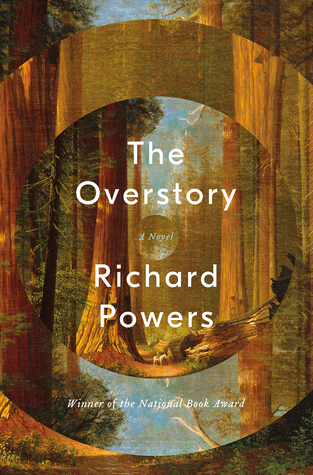 The preaching risk is compounded in The Overstory even before the narrative begins. On the book's copyright page, readers are told that the whole thing is printed on 100 percent recycled paper, which saved “408 trees, 393, 576 gallons of water, 132, 288 pounds of greenhouse gas emissions, and 40, 272 pounds of solid waste.” In the face of such data, whither book reviewing? … she turns back outside, into the woods, the green negation of all careers. She no longer theorizes or speculates. Just watches, notes, and sketches into a stack of notebooks, her only persistent possession aside from clothes. Her eyes go near and narrow … The particle of her private self rejoins everything it has been split off from – the plan of runaway green. The man with his head sticking out of the tent asks himself: What are those treetops like? They're like that cog-toothed drawing toy, spinning out surprise patterns from the simplest nested cycles. They're like the tip of a Ouija planchette, taking dictations from beyond. They are, in fact, like nothing but themselves. They are the crowns of five white spruces laden with cones, bending in the wind as they do every day of their existence. Likeness is the sole problem of men. The handful of tree-chosen go through some pitched adventures that are, in their raw energy, very reminiscent of the clashes with the law in Powers' previous book, Orfeo, and then, intriguingly, the narrative gently moves on and eventually finds some of them looking back at their own adventures and wondering what it all meant. Readers of The Overstory will certainly know how that feels. The book is saved from being simply silly by sheer dint of Powers' staggering writing talent – but it's saved only barely, and no amount of writing talent can disguise the pamphleteering tones. Very likely this is intentional on the author's part, a reflection of his heightened ecological awareness. But it results in something intensely strange: a novel by Richard Powers that feels distracted.